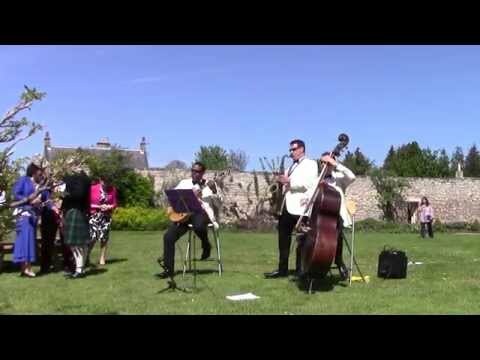 With over twenty years of experience providing quality jazz music in Scotland, The Fairmont Trio will make your wedding or event truly unique, special and memorable. Dressed in our stylish white dinner jackets and with a sound to match we like to think we're the epitome of good taste. The Trio regularly perform our unique jazz sound at prestigious venues in Scotland and further afield including Edinburgh Castle, Gleneagles Hotel, Balbirnie House, The Old Course Hotel, Balmoral Hotel, Hopetoun House and Duns Castle to name but a few! We play an extensive list of familiar Jazz standards such as "Fly me to the Moon", "Have you met Miss Jones", as well as a number of well-known Latin tunes such as "Sway", "Besame Mucho" and "The Girl From Ipanema". Of course we are more than happy to play specific requests with prior notice. Why not consider using the Trio to play for your ceremony? The band has serenaded many brides down the aisle and Marcus, our guitarist is able to play appropriate solo pieces to add variety and change the mood during the signing of the register. Following on from the ceremony is the drinks reception. Lively foot tapping continental style jazz, classic jazz ballads and smooth Latin tunes played by the Trio at an appropriate volume all help to create a memorable experience. Mellow sounds to keep the conversation flowing - guaranteed! Looking for something different to dance to? Then The Fairmont five piece swing and dance band could be just the thing. All the musical ingredients to make your event truly remarkable, right from the very first note. The band play at a volume which will enable your guests to talk to each other comfortably. When the Trio play regularly at a prestigious Scottish venue guests are often seated only a few feet from us and are able to enjoy their evening together as well as the music. If the band is required for dancing the volume can be increased but will still be at an acceptable level. Yes, the band do from time to time play at wedding ceremonies and select appropriate pieces in liaison with the bride and groom. Our guitarist also performs solo guitar which can be very effective during a ceremony. Yes, we do have a singer who joins us as and when required. The band can also be increased to a six piece by adding keyboards, drums and another brass instrument. The group also play as part of a larger nine piece big band. The group is made up of professional musicians who have very many years experience. We are all very guest-friendly. In fact previous testimonials have shown the guests not only remember the high quality of music performed but also the friendliness of the band members. The band normally requires about 2 x 3 metres for the trio (although have played in smaller places!). Setting up time only takes around fifteen minutes for the Trio. Easy. Fill in the form and get an instant date check and price quote. 94.Some Day My Prince Will.. The Fairmont Trio were excellent. Thanks! Fairmont trio were perfect for our afternoon tea, everyone loved them! I was thoroughly impressed and extremely happy with the service I received from Hire a Band and of course, the band I hired itself. The website is amazing and has a massive range of bands all available and clearly set out pictures, types and styles of music, what the band can and cannot do, what type of events the bands would be most suited to, location and price - all the info is there and there is loads to choose from.The Hire a Band team were great - really good at communicating and getting back to you. Nothing was too much trouble - they were friendly, approachable and helpful every step of the way and made me feel looked after and confident in the booking I was making. The band itself, the Fairmont Trio were amazing and went down an absolute storm at our event. Friendly, smart, polite, professional. They were really lovely people and I was impressed they arrived at the venue so early - it made me feel at ease knowing they had arrived and were set up with plenty of time. They were really nice and chatty and looked the part. We had so many comments about staff and guests at the party alike about how great they were - they knew exactly what we wanted from them and their performance and done a great job of providing lively, uplifting and "jazzy" background music which everyone loved, but also not "stealing the show" so they were not what all our guests were fixated on. As this was a corporate event, this party was a chance to socialise and chat to our clients - we wanted to be able to mingle and network and speak to our guests and so we didn't want the guests fixated on the band. They did the job perfectly and we couldn't have been happier! Fairmont Trio were just fabulous at our wedding drinks reception on Saturday . As we were getting photographs done in the grounds we didn't get much of a chance to enjoy how fantastic they were. When we asked our guests what they thought they couldn't have been any more complementary. Marcus was so kind as well they even made the effort to come and speak to us after they had finished. If you are looking for something a bit different and classy then Fairmont Trio is the band for you. If I was to do another event then I would be using Fairmont Trio again as they are just amazing. The Fairmont Trio were fab, looked the part, fantastic! Thank you so much. Hi Hire A Band. Thanks for providing such a good service - very professional. As for The Fairmont Trio - they were absolutely brilliant! We were delighted with their performance and such lovely guys. The Fairmont Trio were a highlight of our wedding day not only for us but our guests too. Many, many thanks guys. The Fairmont Trio were fantastic, they played two requested songs for us outside of their set list and they took requests from the guests on the day. Excellent musicians that really looked the business, couldn't be happier that we booked them! The Hireaband staff were so helpful and friendly confirming all details near the time of the event. As for the Fairmont Trio well they were absolutely brilliant. They played everything we asked for, they looked great and in the run up to the wedding they were easy to keep in touch with. All round brilliant service. Good Morning Del, I just wanted to drop you a note to thank the band (The Fairmont Trio) for yesterday. They were great and went down very well. Thanks again for your help.